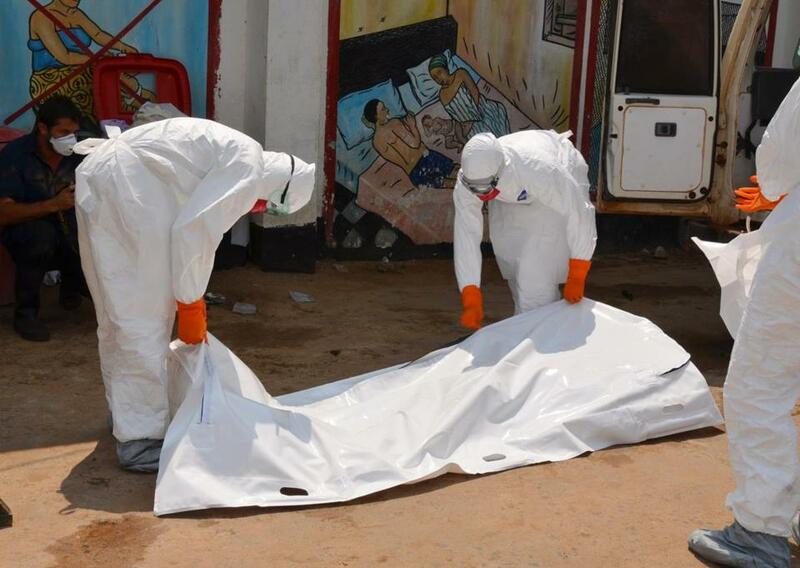 Health workers in protective suits carried the body of an Ebola victim in Liberia on Friday. Last July the Ministry of Health building in Monrovia, Liberia’s capital city, was set on fire. We were shocked: Our designers had been in that exact building only a few months before, presenting a final draft of National Health Infrastructure Standards that we were then helping develop. According to reports, a man whose relative had just died of Ebola started the fire at the Ministry of Health. In his infinite grief, this man retaliated against the Liberian government, whose failure to contain the outbreak he held responsible for the tragic loss of a relative. This man’s anger against the Ministry of Health is understandable. As Ebola continues to spread, destroying lives across Liberia and down the West African coast, many people (nationals and foreigners alike) have called out the Liberian government for its failure to stem the epidemic, branding the health system in our global conversation with the shameful verdict of incompetence. These judgments of the health system are not without truth. At the moment of the Ebola outbreak, Liberia’s health system was indeed weakened and vulnerable. The country was (and still is) recovering from a devastating civil war, which ended only ten years ago. This civil war decimated the nation’s health system, destroying by its end 354 of Liberia’s 550 medical facilities. Today, Liberia’s health infrastructure is dangerously underdeveloped. The condition of many of the hospitals we visited often during our time in Liberia speak to this inadequacy. For instance, the John F. Kennedy Medical Center, a vestige of Cold War American-funded aid initiatives and one of Liberia’s leading hospitals, was in shambles due to highly unrealistic maintenance costs. Redemption Hospital, another important health facility in Monrovia, was in fact converted from a building that had previously been used as a warehouse. As a consequence, the building suffered from dark and labyrinthine corridors, its walls stained with water, and its floors and ceilings showing signs of dilapidation. And yet, the Liberian Ministry of Health was not earlier this year ignorant of these problems. More importantly, the Liberian government was in fact researching, planning for, and enacting the radical, challenging improvements that were necessary to repair their national health system. What is in danger of being lost in the conversation is that the Liberian government was, just before the Ebola outbreak, beginning to take significant and decisive steps towards a new, better, and stronger Liberian health care system — a system that included, at its core, an improved health infrastructure. Along with this new national health policy, the Ministry had already developed a new design for Redemption Hospital and a host of other ‘shovel-ready’ projects which would shore up the country’s weak health infrastructure and help the country move towards its long-term national health goals. This, from our perspective, is where Liberia was on the eve of the outbreak — poised to make dramatic changes to its medical system that would improve the future health and well being of its citizens. The country, of course, was not ready for Ebola. Not many other countries would be. And what is needed now is targeted, strategic support from the international community, as President Obama called for yesterday in a speech at the Centers for Disease Control, that resonates in productive ways with the Liberian government’s existing national health policy goals. Indeed, as international action is taken, parties should respect the Liberian government’s vision to develop a durable and resilient health infrastructure that can support a durable and resilient health system. In other words, we recognize that there is a temptation in this moment of crisis to respond to Ebola with a fleet of emergency shelters, tents, and other short-term strategies to try and stem the epidemic. But (as we saw, for instance, with cholera in Haiti), these kinds of responses are inadequate for safe patient isolation but also in the long-term. Temporary, poorly designed — or even, un-designed — health facilities, while a part of the emergency response, cannot be the entirety of our response. If they are, such structures will not only fail to solve health crises, but may themselves also become health hazards. There is a second reason to be wary of emergency tents and similar improvised infrastructure: Such makeshift interventions cannot blind us from the opportunity to invest in infrastructure that will prevent and control such outbreaks in the future. The international community has already begun to respond to Ebola with injections of funding and aid. This aid is an incredible opportunity in the midst of incredible tragedy to secure the resources necessary to achieve the infrastructure goals that are already laid out in the Liberian government’s admirable national health policy. If done intelligently, such action would couple the necessary speed of emergency tents with the durability and resilience of long-term infrastructure. This building strategy is not only vital in the current outbreak — it is an investment in the future health of Liberians. It is possible to curb this outbreak; in fact, Liberia is well poised to do so and lead by example in West Africa. What remains is the financial support to invest in stated priorities as outlined in its the National Health Infrastructure Policy, and a perception shift to acknowledge we must provide and ensure safe hospitals. When Ebola is all over, the international community will have an important opportunity to consider how and what to invest in to ensure such a devastating outbreak does not occur again. We must choose to build better buildings. Only then will health infrastructure systems finally be strong enough to resist such formidable challenges to their resilience. Michael Murphy and Alan Ricks are co-founders of MASS Design Group, a nonprofit architecture and design firm focused on health infrastructure, with work in eight countries in sub-Saharan Africa as well as Haiti and the United States. David Saladik, director, and Amie Shao, research manager, contributed to this piece.